Last night’s steaming bowl of chili came about because I did not want to go to the grocery store. Instead of wheeling a shopping cart through neatly stacked rows of food, I rummaged through the pantry, the freezer, and the refrigerator to find the bits and pieces necessary to make dinner. I always have canned tomatoes in the cabinet and was happy to find a lone chipotle pepper in adobo as well as a scant tablespoon of tomato paste in the towers of Tupperware that fill my fridge. A lack of beans in my pantry was a disappointment to me, but a gift to my husband who hails from Texas. 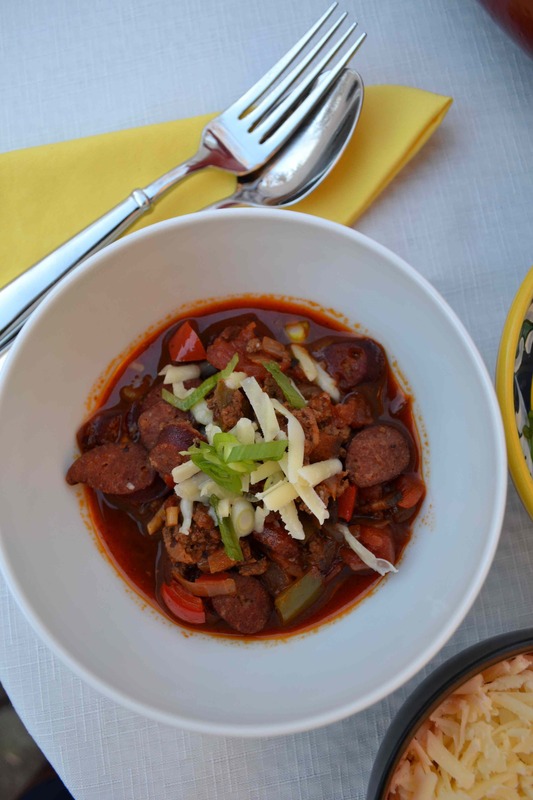 We don’t have time for the beans or no-beans debate here, but suffice it to say that if you are from the Lone Star state you have extremely strong feelings about NO beans in your chili. Harold McGee changed my life for the better a couple of months ago with his article in the New York Times that talked about defrosting smaller cuts of meat in hot water. To summarize, instead of thawing meat in the refrigerator (which can take several days) or placing it in cold water to slowly thaw over a couple of hours, you can dunk, well-wrapped pieces of meat in a pot or sink, full of hot tap water, for about 10 minutes and – viola – you are ready to cook dinner. The short defrost time keeps the meat from being in the danger zone for too long and means that your freezer contents are suddenly fair game when it comes to last-minute meal preparation. 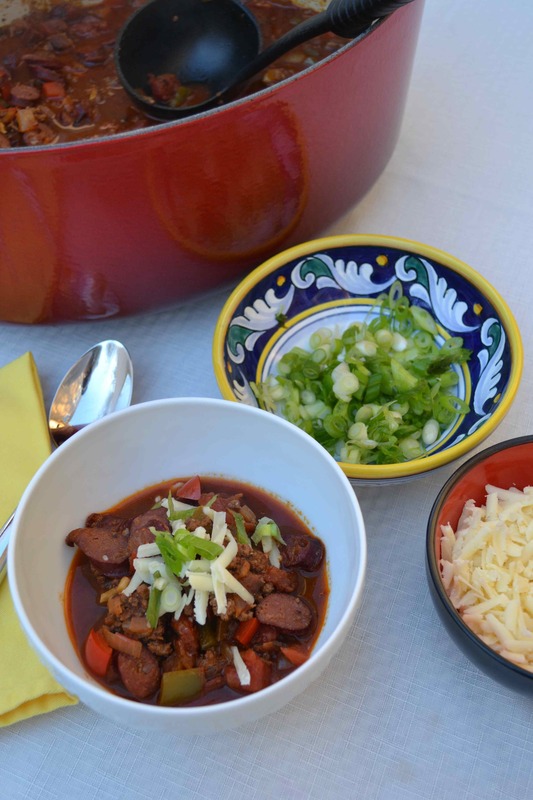 It’s been a game changer in our home and meant that our chili would be of the meat lovers variety. To that end, about 10 minutes after selecting ground venison as well as a pack of venison sausage from my freezer, I was ready to start making my chili. I titled this post “Venison chili (or Refrigerator Chili)” as I suspect most of you don’t have venison in your freezer. If you’ve read this far, don’t click away. 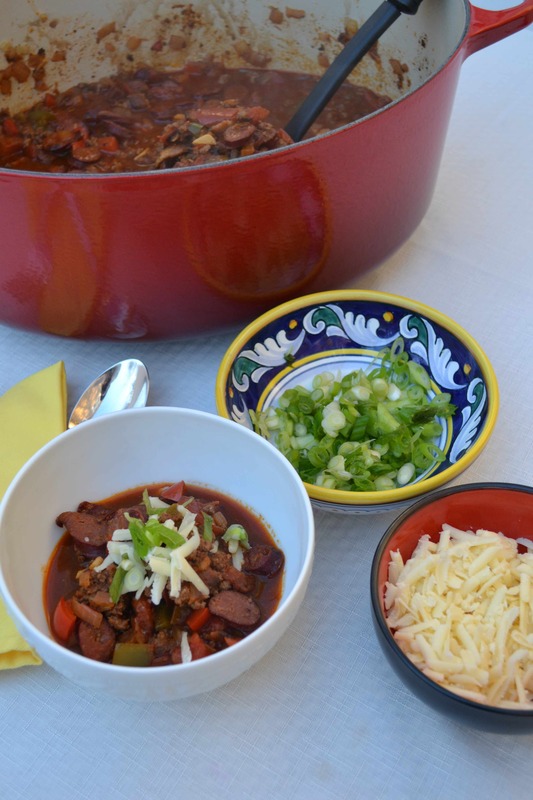 If you follow the recipe exactly you’ll have a wonderful bowl of venison chili, but I hope you’ll instead just use the recipe as inspiration for what to do with what you have in your fridge. Ground turkey, beef, pork or chicken make worthy substitutes for the ground venison. Don’t have venison sausage? Add your favorite sausage to the mix or leave it out completely and instead add a can of beans. Don’t have a chipotle pepper lurking in your fridge or for that matter paprika? Leave it out. It won’t hurt a thing. In fact the only thing you need to keep in mind when making refrigerator chili is to add liquid only as needed. Good chili is thick, not soupy, and so I recommend adding a little liquid at a time to avoid having to cook down your chili to get it to the proper consistency. 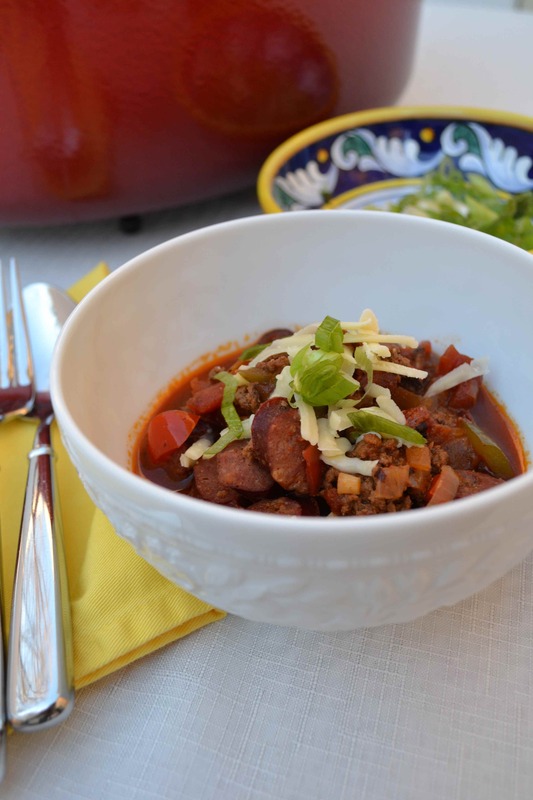 Other than that, venison chili (or your own version of refrigerator chili) is the perfect way to avoid the grocery store while clearing out those odds and ends in your kitchen. Happy cooking! 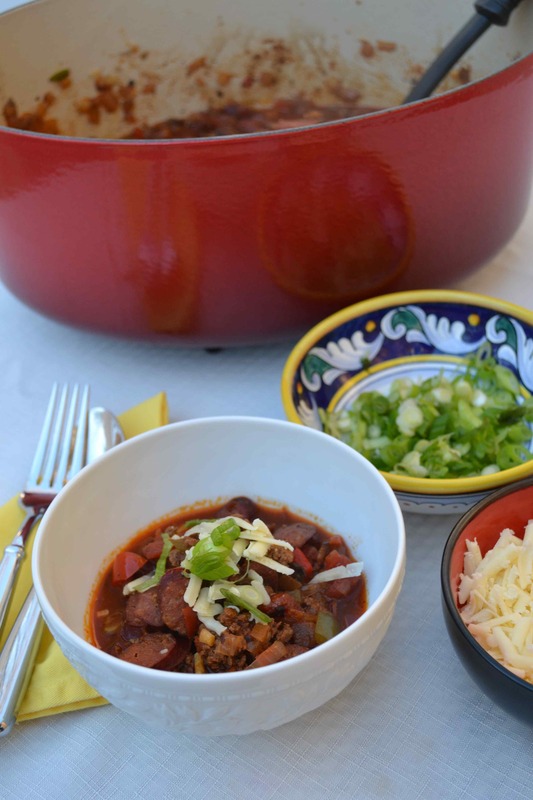 Lucky you if you have venison in your freezer as you’ll love this hearty chili perfect for a cold winter night. For everyone else, use this recipe as a guide to make your own refrigerator (or freezer!) chili. In a large pot, render the bacon over medium heat until just crispy. Remove it from the pot using a slotted spoon and set aside. Add the ground venison and cook, stirring constantly, until browned. Remove the browned venison with a slotted spoon and add it to the bacon. Add the venison sausage and cook, stirring, until cooked through. Remove the sausage with a slotted spoon and set it aside with the bacon and browned venison. If needed, add the olive oil to the pot to get about 2 tablespoons of fat. Add the yellow onions and bell peppers and cook until lightly browned and softened, about 12 minutes. Stir in the garlic cloves and cook until fragrant, about 30 seconds. Stir in the chopped chipotle pepper, the tomato paste, chili powder, paprika (if using), the cumin, black pepper, and salt. Stir to combine then pour in half the bottle of beer. Use a wooden spoon to scrape up any bits stuck to the bottom of the pot. Add the remaining beer, the fire-roasted diced tomatoes with their juices, and the molasses. Return the bacon, ground venison, and sausage to the pot. Add a little of the beef broth if needed to reach the proper consistency. Bring to a simmer. Simmer, covered, for 30 minutes. Adjust the seasonings to taste and serve with your favorite toppings.